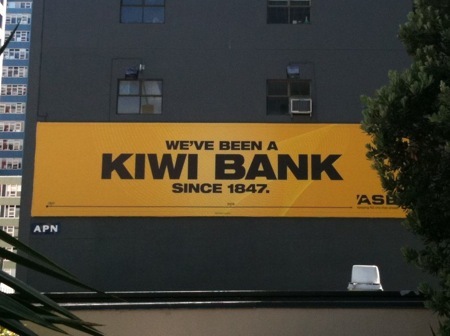 ASB is not a kiwi bank. They were sold to Commonwealth Bank of Australia (as the name would suggest, a publicly listed Australian company) in 1989. Eh? Nobody picks JetStar because of the quality of the onboard service. They are a discount airline – cheap and cheerful. Why do they choose to highlight the exact things they are not? Both obviously feel they need to respond to their competitors’ advertising. Kiwi Bank nicely mocks the “Australian banks” in their ads. And, Air New Zealand has done well to position themselves as the slightly-more-expensive-but-worth-it alternative, by highlighting all of the hidden extras that are not included in the discount airlines’ prices. So, what should ASB and JetStar do? Why not focus on the things that are important to customers that they actually are. ASB is a more difficult example, because, it seems to me at least, that Kiwi Bank has them on most of the areas that customers care about. Perhaps the long slow queues at Post Shops, including people trying to send their Trade Me parcels, is one area of weakness to focus on? Either way ASB need to stop talking about the things they used to be – kiwi owned, leaders online (where is the ASB iPhone app? ), etc – and find a current point of difference. Whatever happened to BankDirect, I wonder? They had a great brand, but it seems to have been left to rot on the vine recently. I remember one ad with attitude they had years ago which said something like: “Our credit cards are black, because we think they look cool” – it convinced me to switch! This is just another good example of something that smaller companies seem to find much easier – talk straight and be yourself. Great post Rowan. This seems to be part of a PR belief, that if you tell a lie often enough it sometimes becomes reality. I’ve noticed many politicians do this, and annoyingly it often works for them. I wonder if consumers are as susceptible when brands do it? People seem to be very motivated to complain when corporates do things they don’t like; see for instance the Cadbury palm oil stuff-up earlier this year. My personal favourite: NZI’s campaign “everybody’s always steeling your stuff” featuring lots of Kiwi icons (like Pavlova and Phar Lap) being claimed by the Aussies. Given that NZI was purchased by IAG (Insurance Australia Group) in 2003, was this purposely ironic? My workmate recently flew Jetstar from Australia. It was 2 hours late leaving and he didn’t get his luggage back for a week. I’ve flown JetStar once, when my tickets were booked by the person I was going to meet. The flights were on time, and everything was no frills, but no problem, as you’d expect from a budget airline – as I said in the post, cheap and cheerful. I suspect the only stories you hear are the horror stories, so experiences like mine for example aren’t part of the conversation. I think the important thing is that your expectations are in line with the likely service, and ads like the one I included above don’t help at all with that. I think Gerry McGovern has answered my question above about how much people trust brands now.